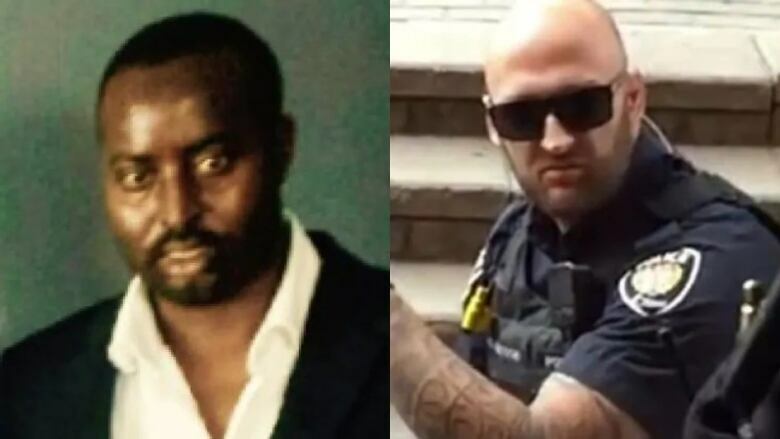 Abdirahman Abdi died in "an arrest gone bad," the Crown told a packed courtroom as the trial of Ottawa police Const. Daniel Montsion began Monday. A police officer's "unjustified" punches to the head and body of Abdirahman Abdi caused the Ottawa man's fatal heart attack outside his Hintonburg apartment building in July 2016, the Crown told a packed courtroom Monday. Const. Daniel Montsion pleaded not guilty to manslaughter, aggravated assault and assault with a weapon as his trial got underway. Assistant Crown attorney Philip Perlmutter began his opening remarks by characterizing the proceedings as a trial "about an arrest gone bad." Did the accused use excessive force? Did the accused cause the death of Abdirahman Abdi? The Crown answered yes to both, and said the events that took place at the Bridgehead coffee shop prior to Abdi's arrest are irrelevant. Perlmutter said the Crown intends to introduce forensic evidence including a CCTV video recording taken from the lobby of Abdi's apartment building. Perlmutter said the video will show footage of Montsion joining Const. Dave Weir at the scene before punching Abdi more than once in the face with a closed fist. Montsion did not hesitate and was wearing reinforced gloves, Perlmutter told the court. He said the footage will then show Montsion and Weir hauling a bleeding Abdi to the ground, where the accused then punched Abdi in the legs and again in the face. Abdi stopped moving shortly after that, Perlmutter said. It was those "unjustified" blows to Abdi's head and body that caused his fatal heart attack, the Crown said. The Crown called David Robinson, a forensic investigator with Ontario's Special Investigations Unit, as its first witness, but technical challenges inside the courtroom cut his testimony short before the court was adjourned for the day. 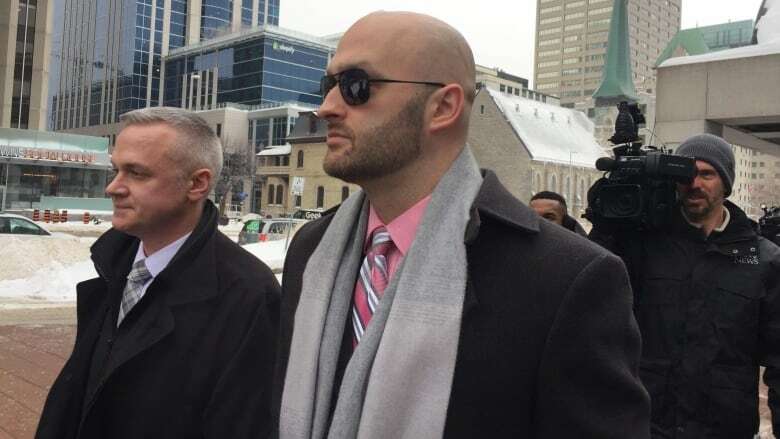 Montsion wore dark sunglasses as he entered and exited the Elgin Street courthouse with the president of the Ottawa Police Association, Matt Skof, by his side. Skof is supporting Montsion during the trial and staying on as police association president despite criminal allegations of breach of trust and obstructing justice against him. Eight eyewitnesses are scheduled to testify at Montsion's trial, most of whom watched Abdi's arrest from the apartment building on Hilda Street where the altercation ended. Others were in the nearby Bridgehead coffee shop where the confrontation began. Some of the Crown's witnesses are family members who were told to leave the courtroom Monday so as not to taint their testimony, standard procedure in such a trial. After Montsion's arraignment Monday morning, the Crown and defence asked for an adjournment until 2 p.m. to give them time to double-check courtroom equipment and prepare materials. Upon return, Montsion's defence attorney, Michael Edelson, complained that many of the police officer's supporters couldn't get a seat inside the crowded courtroom, a problem he framed as a constitutional issue. The courtroom set aside for the trial has a capacity of 41 people — not enough room for all the reporters, Abdi's family members and supporters, and Ottawa police officers who wanted to attend first day of proceedings. Justice Robert Kelly, who was brought in from the Toronto region, said he plans to address the issue and move the trial to a larger courtroom. Twelve weeks have been set aside for the judge-alone trial. It resumes Tuesday.